You can create repeating events in your Teamup calendar. 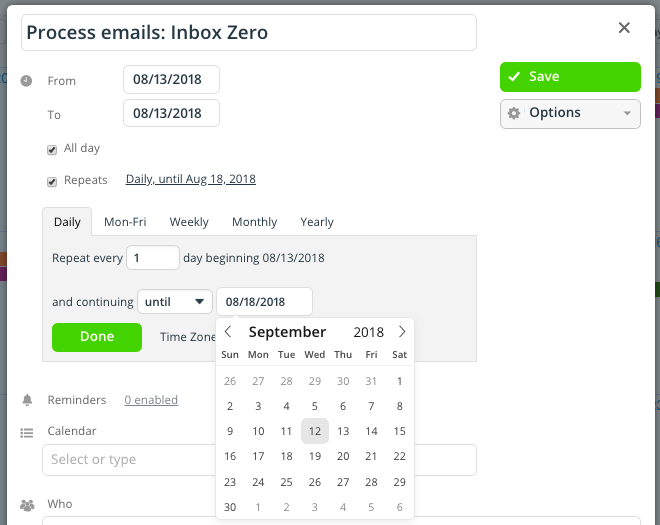 With the built-in options for customization, you can set these recurring events on your calendar to occur on your preferred schedule. 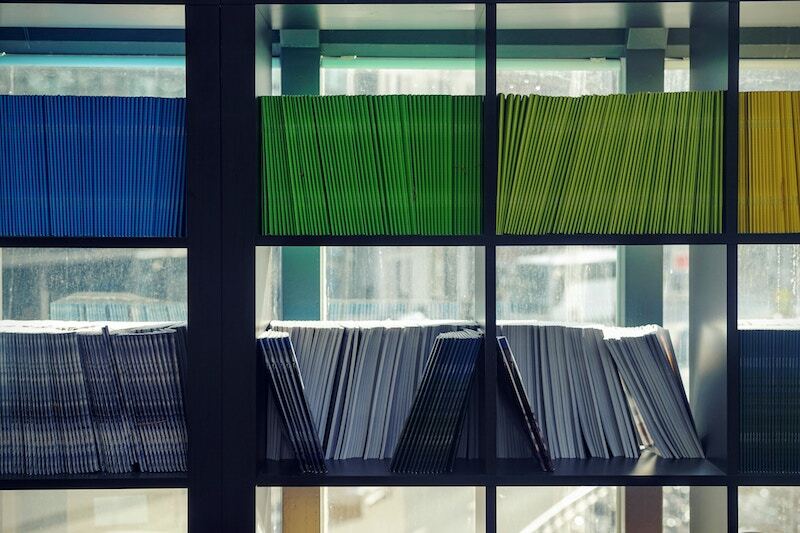 Here’s a look at the ways you can create custom repeating calendar items. The customization options for a repeating event are available in the event editor. For any type of repetition–daily, weekly, monthly, etc.–you can choose the frequency of the repetition. For example, on a daily repeating option, you can choose how many days between each instance of the event. For the monthly option, you can choose how many months between each instance. Choose the number of days between each instance of the recurring event. For each type of repeating event, you have three ways to set how many times an event will repeat: perpetually, for a certain number of times, or until a certain date. The first option is forever. This is the default option for repeating events. Choose when you want the event to repeat and click Save, and the event series will continue perpetually. When you no longer want a recurring event set to forever to occur, you can delete it. 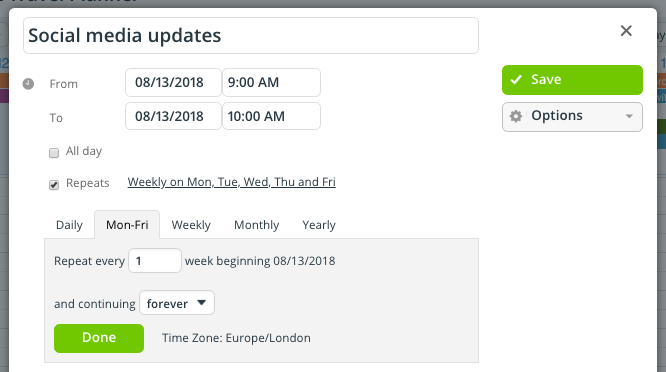 Click on an instance of the event and click delete; you will be able to choose to delete only current and future instances of the event, so that past instances of the event will remain on your calendar. Alternately, you can edit the recurring event to have an end date by changing it from “continuing forever” to “continuing until” and setting the date of the last occurrence. Choose the exact number of times you want an event to repeat. Choose the date for the last instance of a recurring event. You have multiple ways to customize exactly when an event will repeat. The options include Daily, Weekdays (Monday – Friday), Weekly, Monthly, and Yearly. Choose the number of days you want between each instance of the event. For example, you might need to schedule a task that needs to occur regularly but at a rate that’s less than monthly and more than weekly. The Daily option is perfect. Enter the number of days you want for the repetition. 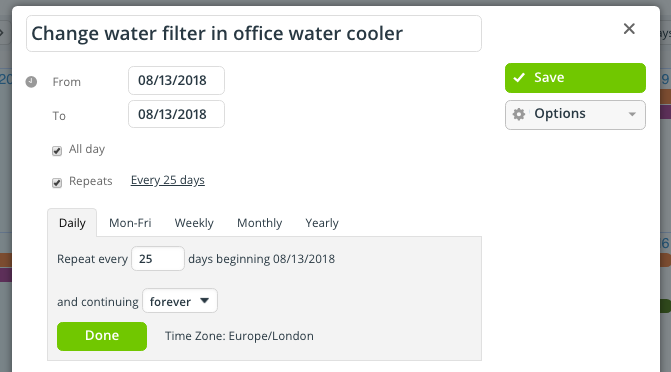 In the example above, the task of changing the water filter will occur every 25 days. Choose if you want the weekday-repeating event to occur every week or not. You can set the weekday-repeating event to repeat every week, or every 2 weeks, every 3 weeks, etc. This allows you greater control over the weekday events; for example, you can create a recurring task that repeats Monday through Friday for only one week of the month, or every six weeks, or every 12 weeks. It’s all customizable. The options for weekly repeating events are very helpful. You can set an event to occur on one day of each week, or on multiple days of the week. Choose one or multiple days of the week for the event to repeat. You can set an event to repeat every Monday, for example; or to repeat every Monday, Wednesday, and Friday. You can set any combination of days in the week for your recurring event. You can also choose if the event repeats every week or every certain number of weeks. Create an event for office cleaning every Tuesday and Saturday, then set an event reminder so you don’t forget to disable the alarm system before the cleaners come. 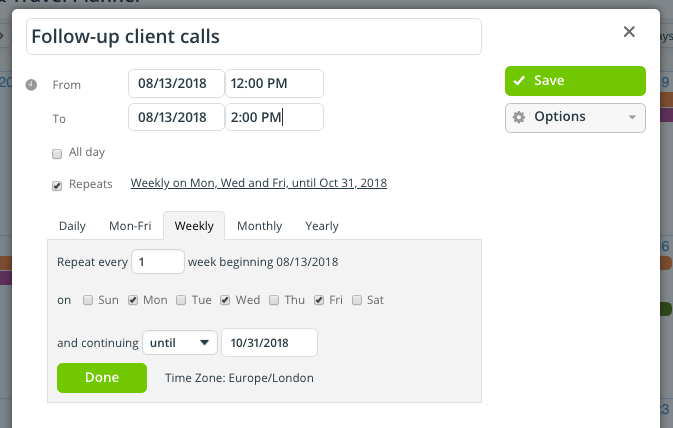 Schedule time blocks for different days: for example, block time on Tuesdays and Thursdays to call on clients. Block time on Mondays and Wednesdays to work with your team on current projects. Block time on Fridays for paperwork. Create repeating staff schedules. Jane works every Monday and Wednesday from 10am to 3pm. Stefan works every Tuesday, Wednesday, and Friday from 8am to 1pm. Set the monthly options for your recurring event. 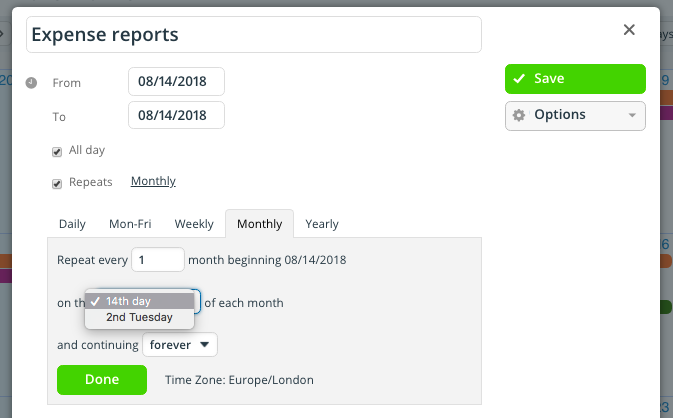 Use the monthly option for recurring events that need to repeat quarterly or biannually, as well, by adjusting the number of months between each event. For quarterly events, set the repeat to every 3 months. For biannual events, set the repeat to every 6 months. For an event to occur every other month, set the repeat to every 2 months. Set the options for repeating events that occur annually or every set number of years. Schedule an event to “begin holiday shopping” in the first week of November, repeating every year. No more last-minute gift rush! Schedule a week-long spring sales event every year. Recurring events can span multiple days. 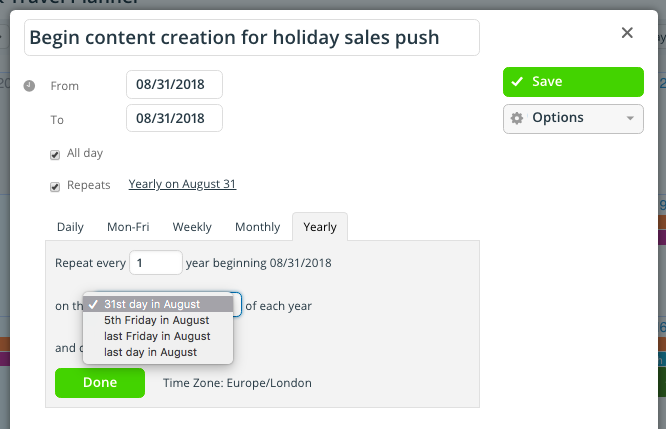 Create reminders for seasonal content production. Schedule them weeks or months before the season itself to make sure your team has enough time to plan and produce the seasonal content. Repeating events save time and give you more efficiency. 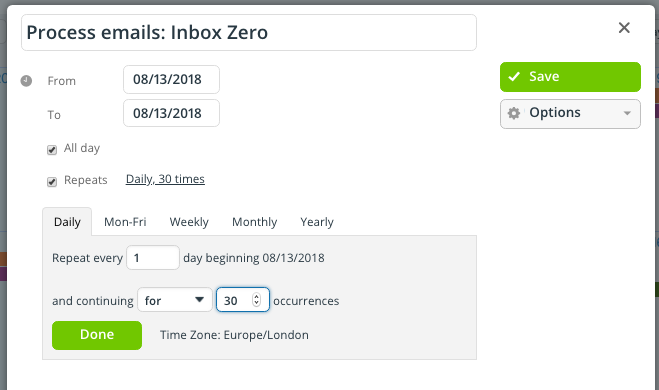 With the right customization options, you can make more events recurring and put more of your scheduling on autopilot. Header photo by Maarten van den Heuvel on Unsplash.